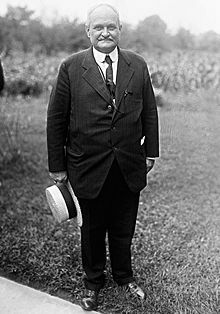 Westmoreland "Morley" Davis (August 21, 1859-September 7, 1942) was a lawyer, farmer, and the 48th Governor of Virginia from February 1, 1918 to February 1, 1922. Virginia elected Davis governor in 1917 on a "wet," or anti-Prohibition, platform. As governor, Davis sent increased funding to Virginia's colleges and universities. He also pressed for aid to farmers and funding for scientific farming research. In general, he reformed and modernized the Virginia government. While governor, he was a delegate to the Democratic National Convention of 1920. During his term as governor, Davis streamlined the state's fiscal operations and reformed its penal system. An agricultural reformer, he also cofounded the Virginia State Dairymen's Association in 1907 and represented the Progressive farm lobby through his monthly journal the Southern Planter. Davis was born to a wealthy and prominent family on August 21, 1859. He was born on a boat in the Atlantic Ocean. The Davis family lost much of its wealth during the American Civil War. Davis and his mother, left a widow, struggled financially after the war, but he was able to attend the Virginia Military Institute on a scholarship. He was the youngest Cadet to ever attend at the age of 14. After graduating in 1877, he taught for 2 years then went to work as a clerk for the railroad company. Later, he "completed a year of post-graduate study at the University of Virginia in 1883," and studied at Columbia Law School from 1884 until graduating in 1886. He joined an elite New York City law firm and became wealthy. He married Marguerite Inman (1 Aug 1882-13 Jul 1963) in 1892. The couple lived in Manhattan for a year before moving to Orange County, NY, where they resided for nine years. The Davis's enjoyed fox hunting and were members of the Orange County Hunt Club. In 1903, Davis purchased Morven Park where he planned to take up farming despite his lack of experience. Davis advocated reform in farming, especially the use of science to improve productivity and sanitation. In 1912, he bought the magazine Southern Planter, one of the most popular magazines in the South. He used his position to advocate his ideas on farming and for political aid to farmers. He was also interested in the breeding of livestock including turkey, cattle and horses. Davis died on September 22, 1942, at the Johns Hopkins University Hospital in Baltimore, Maryland. He was buried at Morven Park. His wife established the Westmoreland Davis Foundation in his honor in 1955 and opened their home, Morven Park, to the public. The Museum of Hounds and Hunting, a carriage collection, and an equestrian center are recent features of the complex.